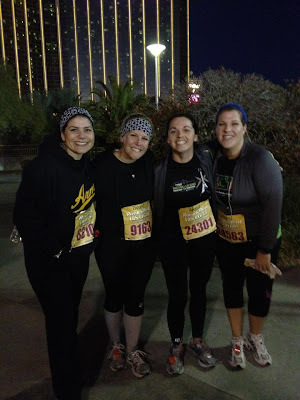 ...the Las Vegas Rock 'n' Roll Marathon & Half on Sunday night. Yes...you read that right...Sunday night. It was my first ever night run (awesome concept!) down and back the Las Vegas strip. It was my first-ever terrible race experience. I won't go into all the gory details (I feel like I have been reliving and rehashing it all in my head and seeing other people do the same on the race Facebook page), but here's a short list of some things that made for a crazy race experience and unsafe post-race conditions. Overcrowding on the course with 40,000 half-marathon participants in the wrong start corrals and a street that was not big enough to handle the participants. Later down the course, the full-marathon runners merged with us making for complete chaos. Tempers were high due to participants being unable to get into their correct corral and therefore having to "catch up" to their pack and weaving around slower runners/walkers. This lead to some really ugly behavior - throwing elbows, using slurs and bad language, etc. Dark streets on part of the course and runners not knowing proper etiquette for walking on the right, with participants discarding all kinds of gear in the middle of the road causing safety hazards for those behind them. Running out of water and Gu on the latter part of the course and rumors of "tainted water" being given out resulting in mass intestinal illness by many runners. I was given some water that tasted terrible and started feeling sick around Mile 10. Later we would hear rumors of the volunteers being instructed to use fire hydrants and hoses to fill water cups. My sister personally saw volunteers using bare hands to dip cups and pitchers into a water bucket with questionable water. Also, I personally saw a runner being handed a Gu packet -- only to wait until the volunteer turned around and grab another handful. Runners coming to a complete halt and having to cross the finish line at a walk due to the heavy traffic in the Finisher's Village and photographers snapping photos too close to the line. Runners not able to get a mylar blanket, medical attention or food/Cytomax because it was gone. In addition, the bananas they had were completely green and unripe. I also think this contributed to my intestinal issues. 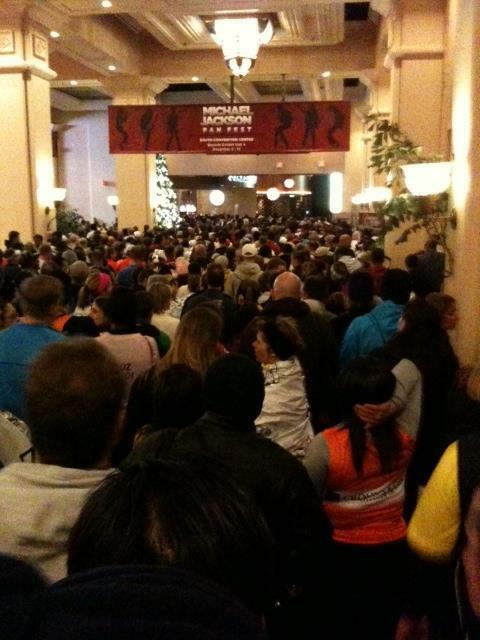 Participants unable to find alleged shuttles to get back to their hotels - resulting in several miles of walking (no cabs available) to get warm and a shower, only to find that many of the casino restaurants were closed for the night. Those who found places to eat waited up to 2 hours to be served. 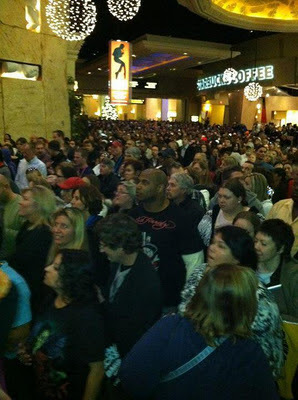 A complete and utter disaster of epic proportion inside the Mandalay Bay hotel comprised of tens of thousands of participants trying to exit the ballroom through to the casino (as we were told to go) only to come face to face with thousands of people trying to enter to see a Cirque du Soleil show that ended in a standoff a la a Clint Eastwood Western. This is the view coming from the Gear Check (mostly runners and their families). At the very end, you can see Starbucks to the right of the tree. You'll need it for reference in the next photo. Once you got into this, there was no turning around and going back the other way. This is mostly attendees of that MJ Cirque du Soleil show who are trying to go the opposite way. This is well past that MJ poster in the photo above. You can see they are streaming in from direction the camera is pointed, but also to the right of the camera. Behind the camera is a huge wall of runners headed to the right, as pictured in the above photo. I almost stepped on two runners who had passed out and were receiving medical attention by EMTs. I was almost knocked over by the above-mentioned trash can and the angry man and his entourage who were insistent upon pushing and ramming his way through HUMAN BEINGS to get to a show. Even when my friend said, "Ow! You're hurting me," he just looked at her with a blank stare, and then his wife moved up to the front of the trash can and tried to pull it through. I haven't been that disgusted, angry and scared all at once in a long time. The Facebook page for the event is rife with complaints about all of these things and more. It started the night of the race and continues three days after the event. People are fuming. People continue to be sick and have been hospitalized. It took more than 24 hours for the race's organization to start to respond to the public outcry and even then they used verbiage that very pointedly stayed away from the words "apologize" or "we messed up." I've seen it posted many times by many people (and once by me)...."all we want to hear is is two words:"
That's it. Not, "we hear your concerns and will work to make next year's event better." That's little consolation to those of us who truly felt like our lives were potentially in jeopardy as we got pinned inside a crowd that was not moving at all and was turning violent. And it's no consolation at all to those who laid on a dirty hotel ballroom floor with the shakes and vomit drying in their hair. Two little words that mean so much and that can be so hard to choke out sometimes. Two words that can mean everything to someone -- the difference between a grudge and forgiveness; resentment or grace. I don't know why the race organizer's refuse to say those two words, but I suspect it has something to do with potential lawsuits and plaintiffs pointing to those words as some sort of admission. I honestly hope this is not the case. Because they definitely need to apologize and assume some sort of responsibility. It's the right thing to do. A few weeks prior to this debacle, I saw a company take the high road and pull up their Big Kid pants and issue an apology for not being prepared for a massive influx of orders due to a sale and coupon offer on Groupon. Rather than turn people away or not honor their deal, they issues a formal apology (actually several) and guaranteed to make it right for everyone who had purchased their deal. The result was an immediate downgrade from fury to acceptance by all those who were ranting on their company Facebook page. People actually started thanking them for responding and hearing the complaints...and yes, for apologizing. Because ultimately, we just want to know that our feelings and concerns matter. That someone or a company would care enough about their customers and participants to feel badly about what was bad for us. 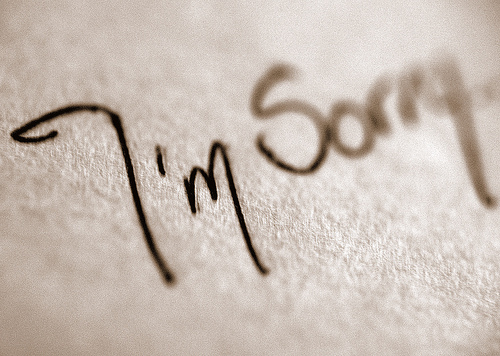 This debacle has served to reaffirm my belief that a heartfelt apology is one of the best gifts we can offer someone. It requires giving up our pride, and sometimes laying down our own feelings of hurt and confusion, but it's an exercise in being human and caring for our fellow man. I have had the best example of this in my life. As a young child, I can vividly remember times when my dad lost his temper with us or maybe said something he later regretted. Rather than leave it hanging unacknowledged or even trying to "make it up" to us in other ways, he would always, always, ALWAYS, come and apologize to us. Yes, even to a seven-year-old. You could set your clock by it, actually. Within 10 minutes of any incident, you could lay on your bed and be assured that he would be coming to make things right. Do you know how powerful that is to a child -- to realize that you matter enough to someone (and an ADULT!) that they would say they were sorry to you? That has stayed with me and will continue to do so for a lifetime. Because of that example, I will never see an apology as a sign of weakness or an opening for future culpability. I will always see it as a sign of personal integrity and strength of character. An apology tells me that you mess up...just like I do. And when I offer one to you, I am showing you that I'm not perfect either. So the next time that you find yourself in a situation where you are responsible in some way -- intentional or not, representing yourself or someone else -- consider the amazing power of the apology. Whether or not it's accepted is not your responsibility. We all have the power to set someone free...who knows, it may just be ourselves. 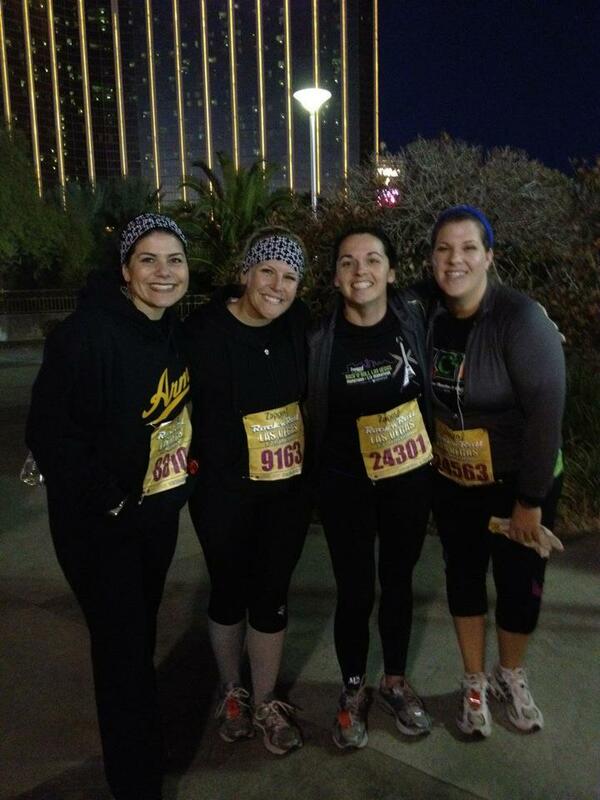 Before the race outside the Mandalay Bay. Postscript: It's about six hours since I posted this blog, and I'm happy to say that the race coordinators finally issued a statement with an apology in it. I can't speak for everyone, but I immediately felt better --less out for blood and way more in a forgiving frame of mind.